I don’t wear hats. I don’t have a this-hat-fits-nicely head. But I wear many (way too many hats) in my work and in my life. 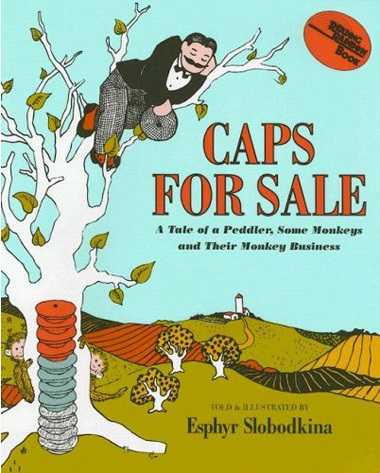 I’m that sales(wo)man in “Caps for Sale” with a whole stack of caps on my head. But unlike him – some days I’d love for the monkeys to steal all my caps and just leave me sleeping soundly under the tree. Work hats aside, there are plenty of “mommy” hats for me. There’s the Mean mommy. I’m the one that makes the boys pick their clothes off the floor and put them in the hamper….and then come back and get that forlorn sock that escaped and put it in the hamper too. That’s the mildest form of Mean Mommy – I come in raging-lava, steaming-head form too. Fortunately, mean mommy is often countered by Loving mommy. Somehow the phrase “give me lovings” has entered the house and it means, “Mommy, I’m hurt/sad/scared ….and just need a hug” or long to still be able to fit on your lap since I’m only 6, though over half your body weight. “Lovings” are good. Lovings are safe and healing. Very closely related is the I had a very long day at work mommy who would do just about anything to have 10 minutes to herself when walking in the door, but since she picked up one boy one the way home from work and is anticipating the hungry cries of two other boys about to enter the door, she just moves into the “I’m very tired mommy” mode. One of the best is the Playful Mommy. She’s “awesome,” she’s “cool,” she’s “the bestest ever.” I like this mommy personally. I’d like to spend a bit more time with her. She wrestles, she plays hide-and-seek even though she hates the game, she throws footballs in the living room and chases you around the inner running track lanes of the house. She’s just so much fun, but too often pushed aside by those other mommies and just not around as much as some poor guys would like. The Chauffer Mommy – which lesson, game, sport, school, playground are we going to today, my dear? The Chief Cook and Bottle Washer Mommy – You will not have chicken nuggets for dinner again, my young jedi, despite your wily mind-trick attempts. The Dreamily Romantic Mommy – my how beautiful and angelic they are….so peaceful….so asleep… so….whoa! what’s that smell?….aw, Seth, not again!! This week though, we’ve been visited by the Sad Mommy whose heart is heavy with news of a missionary family who just lost their precious toddler daughter after being in Kenya for only five weeks. And I look at my boys and I think – how could I ever handle losing one of them? How could you cope with the what-ifs – what if I had done something different? So I become the scared mommy….the protective mommy….the quiet mommy… the oh-my-goodness-life-is-so-fragile mommy. And I realize I have what I have today and only today. A boy who beams with pride for finally receiving his martial arts gi, a squirrely sprite whose eyes twinkle as he flies off the edge of the couch into my arms, and a huggable little elf wrapping himself around my leg. My three sons. Hold them tight – no matter which cap is on the head.